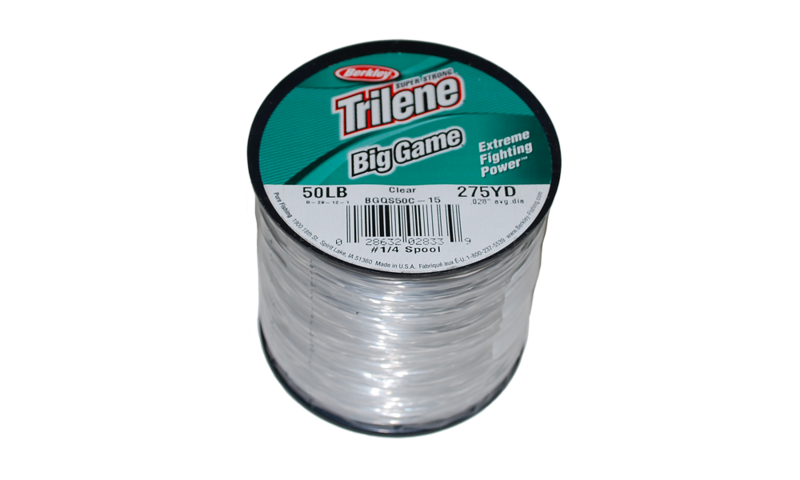 Trilene Big Game Clear 10lbs. 1500yds.Trilene Big Game Clear 12lbs. 1175yds.Trilene Big Game Clear 15lbs. 900yds.Trilene Big Game Clear 20lbs. 650ydsTrilene Big Game Clear 25lbs. 595yds.Trilene Big Game Clear 30lbs. 440yds.Trilene Big Game Clear 40lbs. 370yds.Trilene Big Game Clear 50lbs. 275yds. Strong, reliable, and pretty good low resistance to spool memory.